A painting that depicts the body of Nelson Mandela undergoing an autopsy has been condemned by South Africa's ruling party. The African National Congress (ANC) said the artwork, which is being completed at a Johannesburg shopping centre, violated Mr Mandela's dignity. 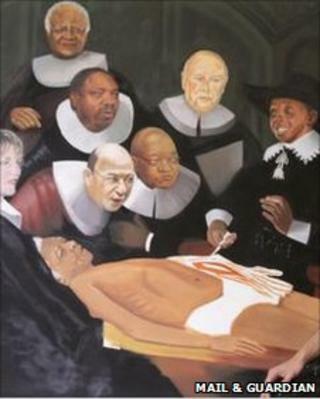 The piece shows Mr Mandela's body being cut open, while prominent leaders crowd around. But artist Yiull Damaso says his aim is to make people confront death. "Nelson Mandela is a great man, but he's just a man... The eventual passing of Mr Mandela is something that we will have to face, as individuals, as a nation," he told the BBC's Focus on Africa programme. The BBC's Pumza Fihlani in Johannesburg says that speaking of Mr Mandela's death is taboo and seen as disrespectful in South Africa because of his iconic stature. Our correspondent says that South Africans do not speak publicly of Mr Mandela dying, out of reverence for him, and perhaps out of a fear of accepting the reality that they would someday be without him. The painting is seen as a take on The Anatomy Lesson of Dr Nicolaes Tulp, a 17th Century masterpiece by Rembrandt which portrays an autopsy undertaken in front of a small group of people, mostly doctors. In Mr Damaso's picture, Mr Mandela is lying on a table, while the late Nkosi Johnson, an Aids activist who died at the age of 12, performs the autopsy. A group of spectators, including Archbishop Desmond Tutu, former presidents FW de Klerk and Thabo Mbeki, and politicians Helen Zille and Trevor Manuel, look on. The ANC also criticised the Mail and Guardian newspaper for publishing a picture of the painting, describing it as "gutter journalism and soul-less sensationalism". The party's statement said the piece violated Mr Mandela's dignity by "stripping him naked in the glare of curious onlookers, some of whom have seen their apartheid ideals die before them". The management of the Hyde Park Mall, where the painting is on display, have received complaints, including from some of Mandela's relatives. "We feel it is a controversial piece... but we support freedom of expression and art," said Marketing Manager Nicola van Kan.